Rosalyn Yalow was awarded the Nobel Prize in Physiology or Medicine in 1977 alongside Andrew B Schally and Roger Guillemin "for the development of radioimmunoassays of peptide hormones." RIA can trace even the smallest amounts of chemicals, hormones, and viruses in the body and has numerous applications in medicine today, such as diabetes testing and drug testing. She is the first American-born woman to receive a Nobel Prize and the first woman to receive the Albert Lasker Prize for Basic Medical Research altogether. July 19, 1921Birth, New York (N.Y.). 1941B.A. degree in Chemistry and Physics, Hunger College, New York (N.Y.). 1945Ph.D in Nuclear Physics, University of Illinois, Urbana-Champaign, Urbana (Ill.). 1945Assistant Engineer, Federal Telecommunications Laboratory, ITT, New York (N.Y.). 1946 – 1950Physics Instructor, Hunter College, New York (N.Y.). 1947 – 2011Consultant; Researcher; Acting Chief of the Radioisotope Service (1968); Chief of the Nuclear Medicine Service (1970); Senior Medical Investigator emeritus (1972-2011); and Director of the Solomon A. Berson Research Laboratory (1973), Bronx Veterans Administration Hospital, Bronx (New York, N.Y.). 1950 – 1972Partnered with Solomon A. Berson on raioisotope research. 1959Yalow and Berson present their discovery of radioimmunoassays (RIA). 1961Awarded the Eli Lilly Award, American Diabetes Association. 1968 – 1986Research Professor; Distinguished Service Professor (1974); Solomon A. Berson Distinguished professor at large (1986), Mount Sinai School of Medicine, New York (N.Y.). 1976Awarded the Albert Lasker Prize for Basic Medical Research, Lasker Foundation. 1977Awarded the Nobel Prize in Physiology or Medicine in 1977 alongside Andrew B Schally and Roger Guillemin "for the development of radioimmunoassays of peptide hormones". 1978Member, American Academy of Arts and Sciences. 1980Distinguished Professor at large, Albert Einstein College of Medicine, Yeshiva University. 1981Acting Chairperson, Department of Clinical Sciences, Montefiore Medical Center. May 30, 2011Death, New York (N.Y.). Partnered together for 22 years to dsicover and develop radioimmunoassays. Advised by Yalow, Hunter College. PhD advisor at University of Illinois, Urbana-Champaign in Immunochemistry. Collaborated at Solomon A. Berson Research Laboratory. B.A in Chemistry and Physics (1941); and Physics Lecturer. Acting Chairperson, Department of Clinical Sciences. Research Professor; Distinguished Service Professor; and Solomon A. Berson Distinguished Professor at large. Consultant; Researcher; Acting Chief of the Radioisotope service (1968); Chief of the Nuclear Medicine Service; Senior Medical Investigator emeritus (1972-2011); and Director of the Solomon A. Berson Research Laboratory (1973). Distinguished Professor at large, Albert Einstein College of Medicine. Awarded the Albert Lasker Prize for Basic Medical Research (1976). Awarded the Eli Lilly Award (1961). Ph.D in Nuclear Physics (1945). Clark T. Awin Memorial Library. Academic Tree: Rosalyn Yalow professional relations list. American Nuclear Society Nuclear Café: Women’s History Month- Physicist Dr. Rosalyn Sussman Yalow. Jewish Women's Archive: Rosalyn Yalow biography. New York Time's Yalow obituary. 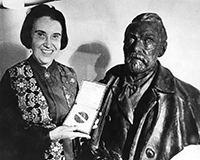 Nobel Prize Laureate Rosalyn Yalow biography and facts. Physics Today obituary: Rosalyn Yalow. Rosalyn Yalow, Nobel laureate : her life and work in medicine : a biographical memoir / by Eugene Straus.